Antiques of all kinds make great and unusual gifts. The perfect choice for holiday presents. Of course gift choices may depend on the receiver's tastes, but many antiques have a feminine nature and are universal. Most women just like pretty things, especially little treasures. But don't worry, we have plenty of gift ideas for men, too, including man-cave accessories and a lot more. Does she like Roses? Daisies? Violets? Another favorite for ladies are Antique Vanity Items like perfume bottles, sterling silver compacts, dresser sets, hat pin holders, or even ring trays or pin cushions. 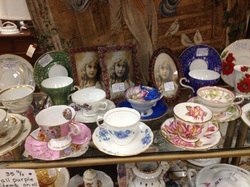 Pretty Vintage China is another favorite of many women and is very much is style again. Some like matching cups and saucers, some like a matching cream and sugar set, a beautiful tea pot, or some like an assortment of tea cups with a theme as simple as roses. Bone China from England is especially coveted by many women. DID YOU KNOW COOPER CITY ANTIQUE MALL HAS A WISH LIST? Just ask for it at the front desk. Vintage Linens and Needlework is another great gift item .Beautiful vintage linens are great gifts to consider: quilts, pretty vintage tea towels, lace dresser scarves and crocheted bedspreads. There are so many choices and they make lovely treasured heirloom gifts. Whatever style or period of fashion the recipient is partial to, there are gift ideas for every vintage clothing collector. Pretty feminine antiques make lovely gifts, but before making a huge investment, be certain the recipient will love it - that it's "so her." Antique Gift Ideas for Men Antiques of all kinds make great and unusual gifts for men as well. The perfect choice for holiday presents. It's often difficult to buy gifts for men at the holidays, but with antiques, you can find gift ideas that are unique and will be well-received for this or any other occasion. Most men have a favorite sport or a number of sports they enjoy. What better gift for a guy then a gift with the theme of their favorite gift with a vintage flair. A vintage tennis racket for a tennis player, a golf club for a golfer, or a fishing gear for a fisherman. Vintage and antique sporting gear has become highly sought after in recent years and the list of possibilities is long. Sporting presents for men are just "cool" to own. Vintage and antique books and maps are another unusual present for the men on your list. If you know their interests or hobbies finding an old book on anything from beekeeping to fly fishing, chess, horticulture, history or even basket weaving can really take them back in time with subjects they enjoy. Old books on topics they love are really well received. Also worth considering in this genre are antique maps and prints. When framed, they make interesting conversation pieces. Many men are history buffs and love to collect military memorabilia. Antiques do make great gifts for the men in your life. Some Personal Presents for Men include vintage and antique personal care items such as shaving brushes and shavers, or are considered highly collectible. When you buy a gift that's old it may be something he already collects, a conversational piece for his den or office or even usable presents, rather than simply decorative. Shopping for antique holiday presents for men is a fun way to buy a gift.